Chase Utley had quite a game. 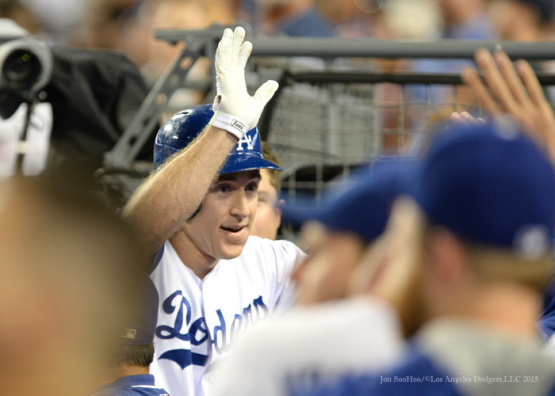 "I'd like to be in the lineup anywhere," Utley said. "Just try to have good at-bats wherever you are in the lineup." "Chase has made a big difference for us since he came -- his tone, the way he plays, his preparation," Mattingly said. "It's been an addition in attitude and the way you go about your business, for sure. Sometimes, you can't measure everything. You look at batting average or whatever with guys; some of it's coming from different areas that are important to your ball club." Via Cary Osborne at Dodger Insider, "Vin Scully: World-record broadcaster." During pregame ceremonies at Wednesday’s game at Dodger Stadium, the Hall of Fame broadcaster was given a surprise presentation by Guinness World Records recognizing him for the longest career as a sports broadcaster for a single team. The record stands at 65 years, 5 months and 22 days, which dates back to April 1, 1950. Want to know what's it like to catch two aces? AJ Ellis lets us know. Via Ellis at the Players' Tribune, "Catching Aces." This is a must read. Awesome stuff! I was an older guy for that level, already 26. I think that’s what my role was in the Dodgers organization at the time: helping pitchers develop. Coaches trusted the work I did. Clayton didn’t have a slider yet, and they wanted him to develop a changeup, too. I remember he was warming up before his first start, working on that changeup. It was a very inconsistent pitch for him, and he was having trouble throwing it, missing high and away. On Greinke: I learned quickly what’s important to Zack and not to waste his time with trivial stuff. We have a mutual love for how the game works and how decisions are made. He is interested on an intellectual level in game management and pitch sequencing. He loves the deeper-level analytics and is really involved in our defensive shifting. It’s also a question of reading Zack and knowing when he wants some space and when he’s ready to engage. "My family and I very much mourn the passing of Yogi Berra. We of course admired Yogi’s contribution to the game. And Yogi and his beloved Carmen and I enjoyed a lasting relationship -- often greeting each other through the years with a humorous exchange of “He was out”/ “He was safe” related to that first game of the 1955 World Series. I extend my love and deepest sympathy to Dale, Tim and Larry and their families. Farewell, dear Yogi." Topps is currently polling collectors to see who they want to be card #1 in next years flagship Baseball card set. Go here to cast your vote. I obviously chose Clayton Kershaw. 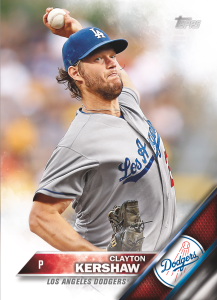 BTW, take a look at a mock-up of the 2016 Topps Kershaw card on the right. Via Josh Carpenter at Sports Business Daily, "Minding My Business With Dodgers VP/Ticket Sales David Siegel." Exec I most admire: MLB Senior VP/Baseball Operations KIM NG. Being a female minority in a typically male-dominated industry, the fact that she’s been able to be an Assistant GM for two teams and now with the league, I’ve always admired her business and political acumen and being able to navigate all those challenges. She’s been a great source of support for me.